The Kramer Angle: Post Lucketts Analysis! 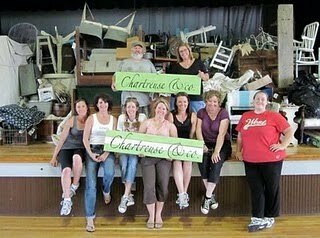 Yes, the Luckett's Spring Show was absolutely fabulous and I do believe Chartreuse and Company totally rocked it, but for me, it was much more than whether I sold everything I brought. It was actually much bigger than that. In many ways this has been the happiest year of my life because it has also been the most personally fulfilling. I spent last Thursday through Sunday with the most amazing group of women (and a few dudes) I've ever met. In addition to being blessed with a supportive husband (mostly!) and great kids (mostly! ), I'm out there literally living my dream (which keeps getting bigger and bigger every day) and each and every one of the group from Chartreuse has touched my life the past year. Truth be told, the most annoying, obnoxious group of people I've ever met! brings me great joy to be associated with each and every one of them. So, thank you to the Chartreuse girls (and dudes) for one amazing weekend! Sounds like you're a lucky girl! Nailed it on the head!